When the world is moving at a fast pace and the night is turning into day, there needs to be a technology that could keep people updated and entertained. Such a technology, which amuses people and offers them leisure, fun and information is LED media facades. Lighting concepts like this exploit the full potential of a society that lives at an increasingly fast pace. They enable companies, brands, and towns to communicate with their environment even at night. What Is LED Media Facade? Outdoor LED Walls are revolutionary development because of the controllability of the brightness and color of LED Light sources. Façade lighting can be realized from inside a building because of LEDs. Hence, it is now possible to integrate light sources into architecture to give shape to LED Media Facade. Facade lighting creates added cultural value because they form picturesque landscapes in the building, which lure in a colossal audience. This boosts revenues and enhances prestige. 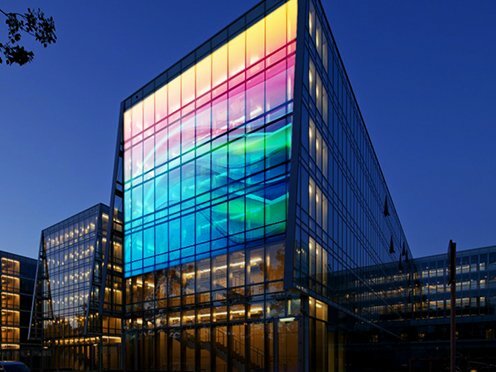 Most buildings now demand an LED media facade that would rightly blend rightly with the aesthetics of a building. Façade lighting needs relatively little energy to generate the required luminance levels. It is unobtrusive and energy efficient. They consume less energy and cause less light pollution. They convey information that goes beyond the mere presence of a façade. They provide boundless scope for presenting brands, values, and messages: text, images and animations can be projected onto the controllable LED pixels. Among various methods used, an LED Stripes can be integrated into glass, which then accepts video signals. An instance of such a technique currently used is in “Balance Tower” in Barcelona. More than 22 meters of the tower is equipped with vertical stripes with a horizontal distance of 1m. Similarly, the LED technology is integrated into stripes, which are then assembled to meet the exact customer requirements. However, LED media facade has a high demands on the durability of the material. Outdoor LED displays have manifold benefits as they facilitate orientation, convey messages, communicate emotions, and create attention. The degree of lucidity and resolution that Outdoor LED Video Walls feature is simply amazing, and they display an excellent picture quality. Subsequently, Outdoor LED Video Walls are widely used in various places like Malls, Markets, Stadium Shows, Bus and Railway Stations for advertising purpose, Live Outdoor Events and different places. Thus, a large outdoor LED screen can be spectacular, particularly at night. The public can see large outdoor LED displays from long distances, in all types of lighting conditions. This is a huge advantage over other display advertising methods. The display itself can really enhance the perception of business by audiences. These types of large-scale screens and digital billboards can be installed almost anywhere, even in moving vehicles. These screens can make a massive impact in the right environment. The chief aspect is that the Outdoor LED Display is extremely power efficient besides being amazingly attractive.